As I've alluded to once or twice, I used to work for the World's Biggest Bookstore in downtown Toronto, a part of the Chapters-Indigo chain. About the same time I moved on to being a professional writer many of my coworkers at the WBB also moved on to bigger and better things, including my manager Justin Sorbara-Hosker, who now works for Indigo's online department. A couple of weeks ago Justin and the staff at Simon and Schuster were kind enough to forward me a copy of Shawn Green's new book "The Way of Baseball" which I reviewed for Indigo's blog. Below is my introduction, followed by a link to the rest of the article. 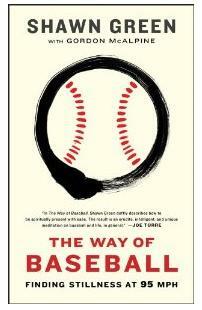 Shawn Green's The Way of Baseball has a concept so simple it's amazing no one has done it before—it uses hitting a baseball as an evolving metaphor that can be applied to everyday life. Green draws on his career as a right-fielder with the Toronto Blue Jays, Los Angeles Dodgers, Arizona Diamondbacks and New York Mets and examines how he used batting practice as a method of finding peace and balance in his day-to-day life. The book is broken into nine chapters titled “Stillness,” “Space and Separation,” “Awareness,” “Ego,” “Presence,” “The Zone,” “Nonattachment,” “Gratitude,” and “Epilogue”. Each section details a step in Green’s personal journey as he develops stillness and awareness at the plate and in his interactions with teammates, coaches and fans.